It used to be that if brioche French toast is listed on a brunch menu, I picked that dish. Maybe I have a slight obsession, but sometimes I even dream about it. 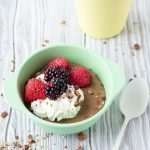 Then one day, as I was about to spend £15 for 2 slices of this dreamy custardy dish, I realized that it is one of the easiest brunch recipes to make. And I really should just make it for myself at home. And since there’s no reason to keep the recipe to myself, here it is for you. 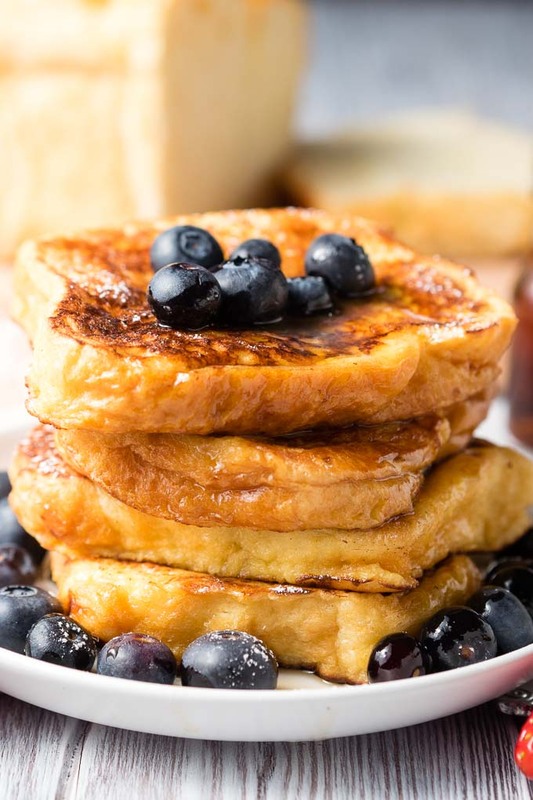 My easy brioche French toast recipe, with tips and tricks to help you make the best stack of fluffy custardy French toast. 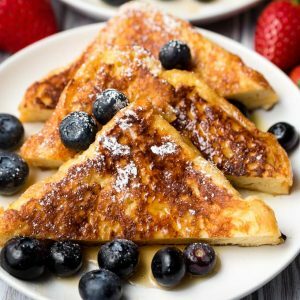 What is brioche french toast? 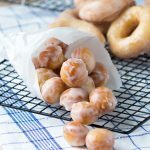 If you’ve never tried it before, you might be wondering what all the fuss is about. But let me tell you. 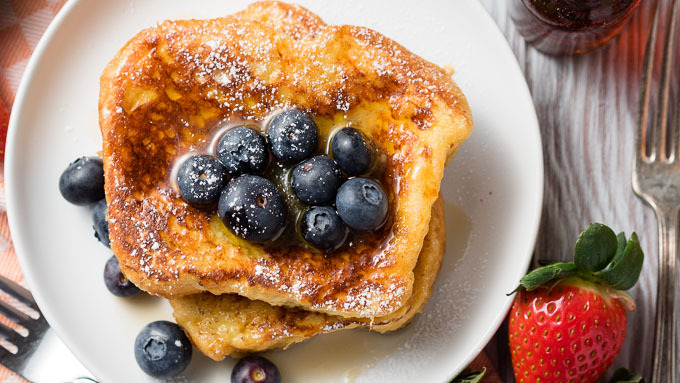 Brioche French Toast is a dreamy, buttery and decadent sweet brunch. French toasts can vary so wildly from homey and simple to lavish and grandeur. I think of this variety as the weekend special. 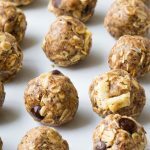 It’s perfect for when you want to slow down and throw all dieting rules out the window. 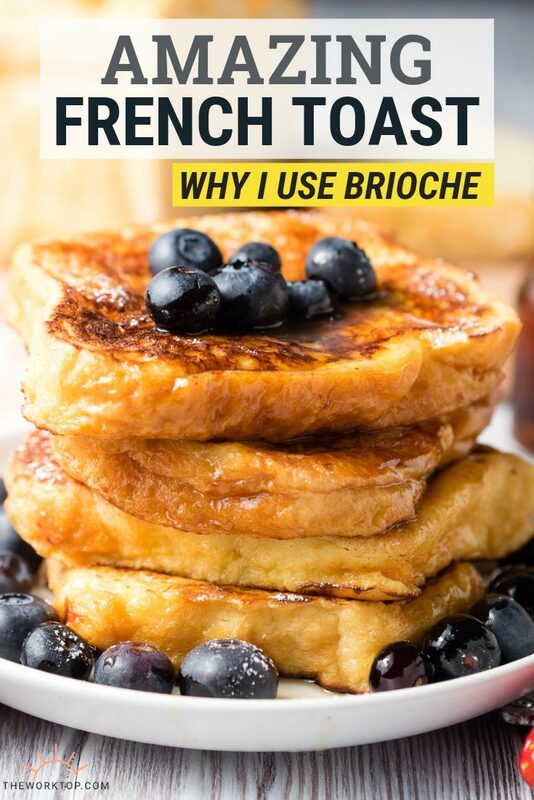 What is the difference between using brioche and regular French toast? Simply said, brioche French toast is regular French toast that has received a major upgrade! The basic concept of dipping bread in eggs and pan frying it is the same. But you take brunch to a whole new level when you make French toast with brioche bread. Be on the lookout for an especially a good quality brioche loaf made with: real butter, eggs, milk or cream, and sugar. This is a breakfast recipe where you’ll want to grab the best bread you can. And it’s my opinion that you need to serve this classic French toast with a pat of melted butter and pure maple syrup. 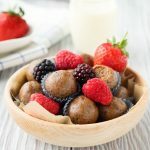 If you are looking for a baked French toast recipe that uses brioche, don’t miss this Baked Stuffed French Toast Casserole. Why is Brioche a good bread for French toast? The bread is nice and thick, and soaks in the perfect amount of egg. You can actually taste the richness of the bread with every bite. 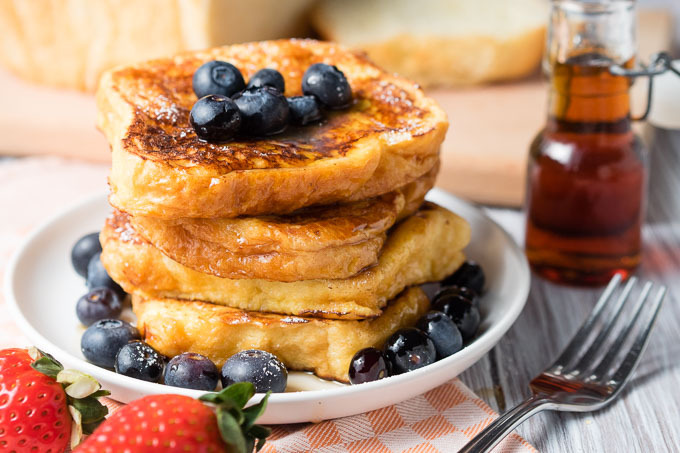 Brioche makes puffy fluffy French toast that looks beautiful stacked. Brioche bread is naturally soft but not too soft. Each bite will be custardy but firm enough to pick up with a fork. 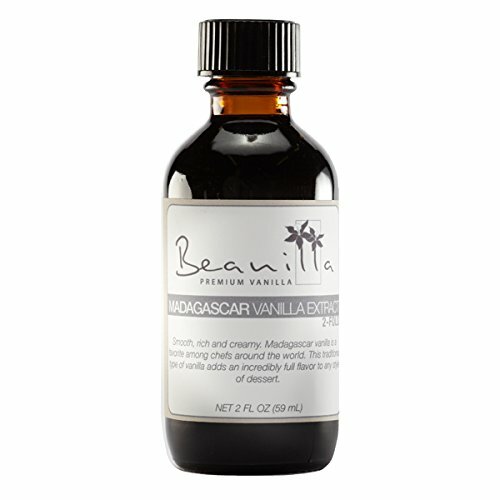 TIP: If you love vanilla, try a double-fold Madagascar Vanilla Extract. What does double-fold mean? Made with twice the amount of vanilla beans for an incredibly full flavor. To make this easy recipe, the simple concept of making French toast applies. Dip the brioche in an egg custard mixture and pan fry it it on a skillet. Even so, here’s my biggest tip on how to make French toast fast: Pour the egg custard mixture in a 9×13 baking pan, and soak up to 6 slices of bread at once. Simple right? Maybe you already knew that trick, but truth be told, I used to dip my French toast slices one at a time. Now, I just pull out the baking pan and soak all the bread slices at once. 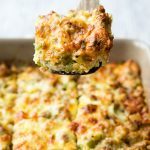 If you use two big square skillets, you can make 8 slices at a time! 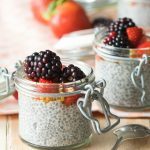 I keep the toppings simple when I serve this brunch, using just a knob of butter, pure maple syrup and a handful of fresh berries. You can really pile up the decadence if you add some fresh whipped cream too. I think you’ll love this banana whipped cream on it. Everyone has a different classic french toast recipe. This is ours when we want a fluffy and rich french toast. I really hope brioche French toast becomes a classic brunch dish for your weekends. 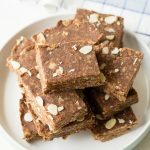 Any questions on how to make this recipe, feel free to let me know in the comments below. 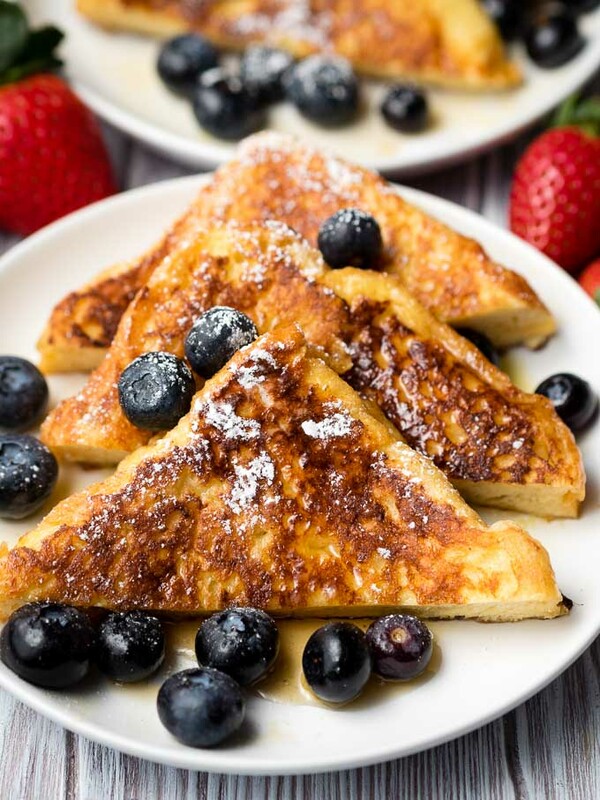 Brioche French Toast is a decadent brunch that the whole family will love. 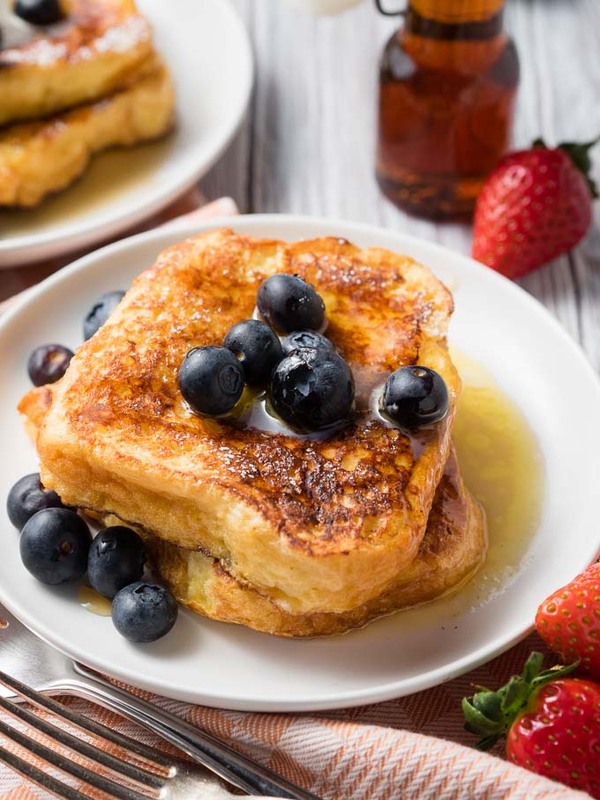 This easy French toast recipe is quick to make, and sure to make any weekend brunch special. In a medium bowl, beat the eggs together well. Beat in the milk, sugar and vanilla. 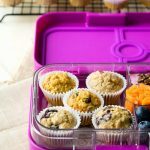 Layer the brioche bread in a single layer across a large baking dish (I use my 9-inch x 13-inch baking pan). Gently pour the egg mixture over the bread slices. Allow to soak for 2 minutes. 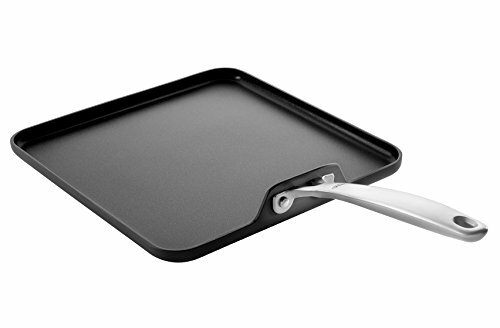 Gently flip using a spatula. Allow to soak an additional 2 minutes. Tip the pan around if needed to help the bread absorb the egg mixture. The bread should soak up all of the egg mixture. Heat a large skillet on medium to medium-high heat. Melt a knob of butter on it. Gently transfer all 4 brioche french toast to the pan. Cook until the bottom is golden brown, about 3 minutes. Flip and cook until the other side is also golden brown, about 3 minutes. If you feel like your french toast is browning too quickly, turn the heat down. Serve immediately. 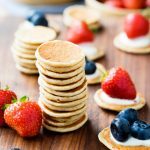 Top with butter, maple syrup and fresh berries, or use your favorite toppings. What beautiful photos! 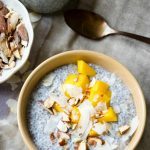 This looks like a breakfast I grew up with, but yours is prettier! ;) Lovely for Mother’s Day or Easter!